Tangential Force is the Key! The combination of the radial-acting spring force and the tangential force produced by the toothed slot increases the contact pressure between the pin bore and the pin. That pressure is why you buy a spring pin! 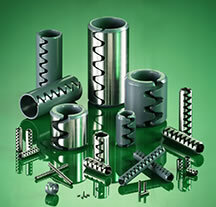 Designed and Manufactured for the Most Demanding Applications!